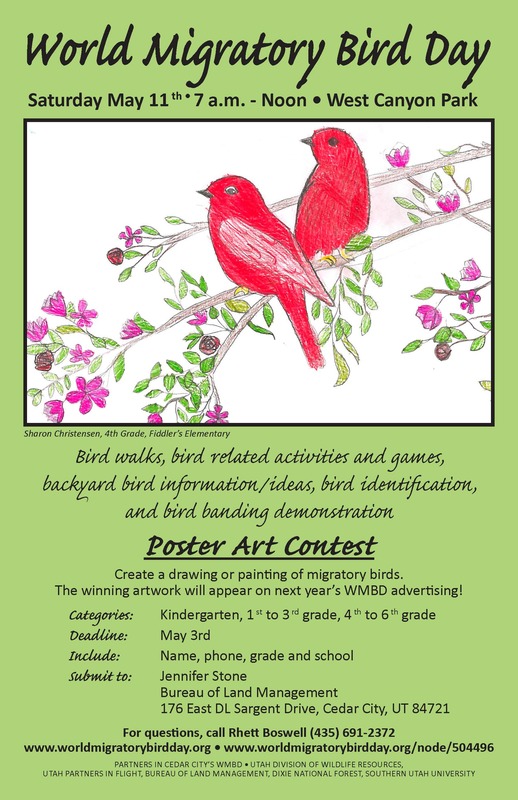 Prizes will be awarded to the top poster art submission from each grade grouping (Kindergarten, 1st - 3rd grade, 4th -6th grade) on May 11th at the event. All Are Welcome! Come enjoy the day learning about the birds in your area. Did you know that all across our globe there are “flyways” in the sky that migrating birds use to travel from north to south and then back again every year? Although birds migrate year-round, migration usually peaks in the spring and fall. The actual dates of when birds migrate depend on many factors, including bird species, overall migration distance, travel speed, route, climate, weather patterns, and more. Instinctively, birds know where to migrate and how to navigate back home. They use the stars, the sun, and earth’s magnetism to help them find their way. They almost always return home to where they were born. This is why you could be right if you think you see the same bird each year in your backyard. Some birds migrate during the night because the air is cooler and they do not need to stop to cool down. There are also fewer predators at night. Migrating birds face many threats along their journeys, including window collisions, confusing lights at night that disrupt navigation, hunting, and habitat loss. But not all birds migrate north to south. Some move from high to low elevations and manage to survive winter while staying right here in Utah. Utah happens to be a very important “flyway” for migrating birds and world famous for birding locations. Utah is home to more than 450 bird species. Bird watching in Utah is a great family activity, and the state offers many locations to see a wide variety of bird species. World Migratory Bird Day, on Saturday, May 11, 2019, honors the spectacle and struggles of our feathered friends as they make their long and difficult journey from the tropics of Central American to the cities and forests of North America. Please join us at Cedar City, West Canyon Park, 7:00am – 12:00pm, for this exciting event. Discover how you can help our migrating friends right at your own home. Stroll through our gallery of local bird booths, take a walk to learn about birds in our area, discover how birds are banded and tracked for scientific study, and learn some useful birding tips and tricks. We’ll also have a poster art contest, crafts and games like making a birdhouse and a rubber ducky race and more! For more information call Rhett Boswell at 435-691-2372.